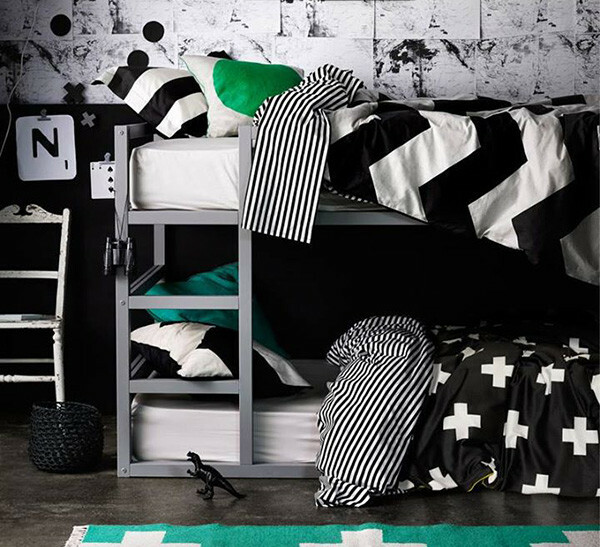 Amazing shared bedrooms for children - when every night is a slumber party! 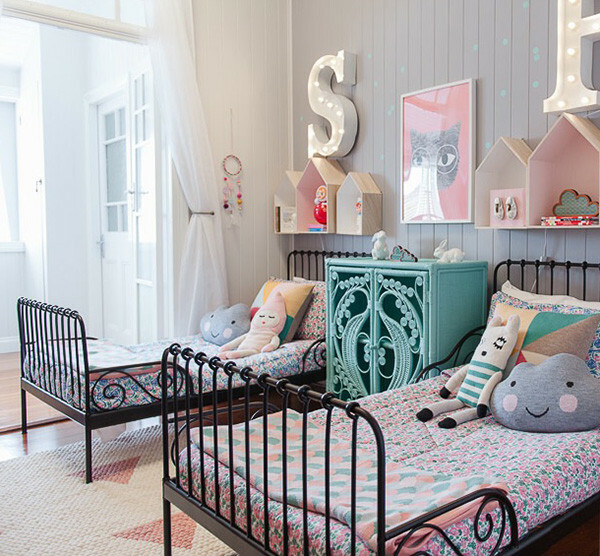 Amazing shared bedrooms for children – when every night is a slumber party! Which two words can make the calmest of us break out in a cold decorating sweat? Shared bedroom. We’ve been there and done it twice over in our home and as fun as it was (for the kids), it wasn’t so much for me, trying to make the space work. But these shared room ideas are so swoon-worthy, they almost make me want to put all of my kids in the same room together again. Almost. If it’s symmetry you seek, matching beds are key. Find a pair you love and go from there, or if the budget doesn’t extend that far, makeover the kids’ existing beds with the same coloured paint. 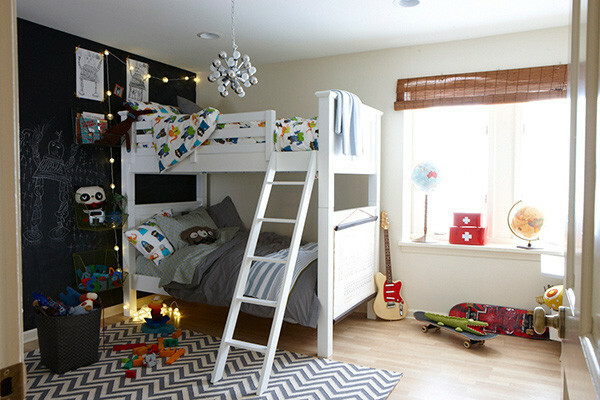 Bed positioning is going to make or break the floor space – consider a bunk bed or lining a wall with beds top and tailed, as seen above on Rafa Kids. Bel of Petite Vintage Interiors knows how to work a child’s space like no other interior designer I’ve seen. 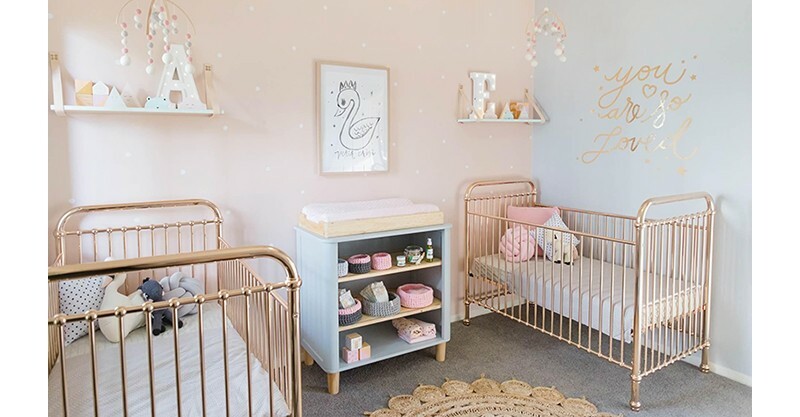 It’s her magical work you see at the top of the post, giving us a glimpse of Sophie’s twin nursery and here in Freya and Sybilla’s stunning space, beautifully captured by Vellum Studios. 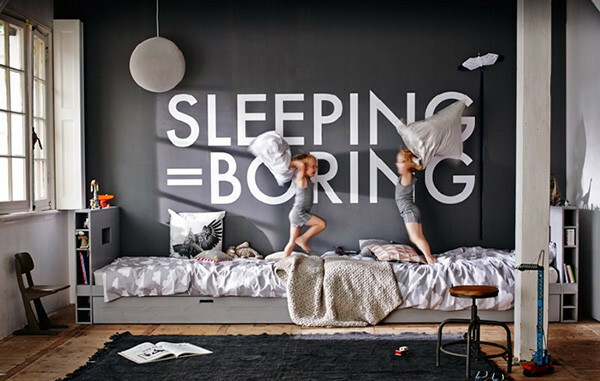 Over at La La Lovely, we can see how two brothers share a fun room with a bunk bed and chalk wall to boot. 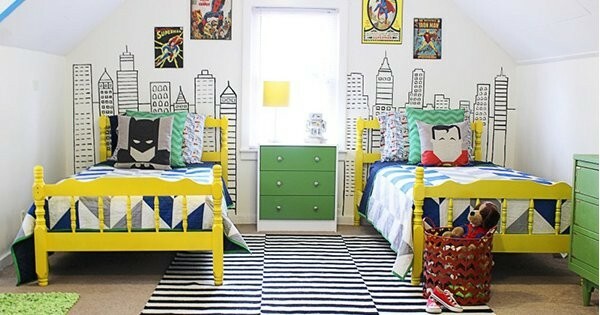 Our superhero bedroom makeover post was a hit with you all and we were keen to paint a cityscape on every wall! 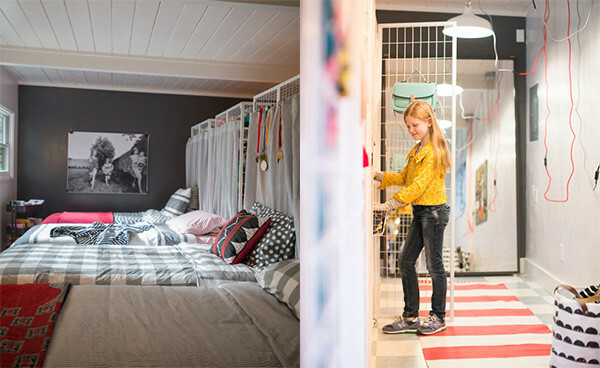 We see how four sisters share a sweet room at Designmom. Gosh, can you just imagine the stories being told at night? I adore the vintage vibe of this bedroom from A Golden Afternoon. 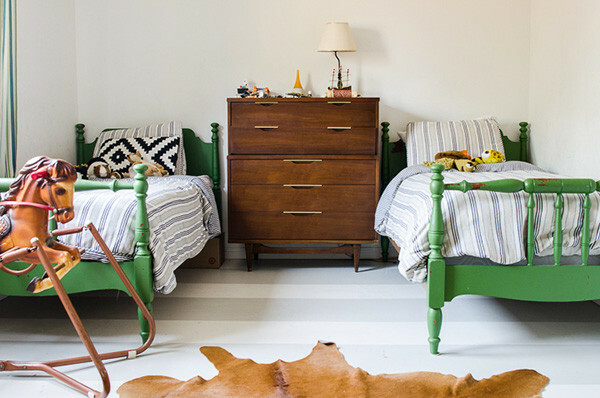 A pair of ticking striped quilt covers on glorious green beds is divine and the contemporary striped floor gives the vintage vibe just a hint of an intentional modern edge. One of our very own Babyologists created this beautiful space for their twin girls! Be sure to head to Ava and Indiana’s nursery post for even more gorgeous pics! 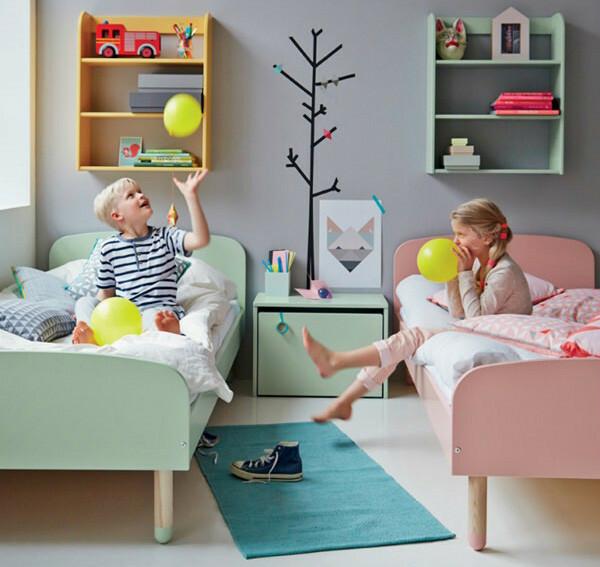 Deco Peques show us how pastel colours can work for a unisex shared space and how a cot doesn’t have to look out of place when paired with a single bed. A design brief of all things pretty was nailed in this granddaughter’s guest room makeover at Nanna’s house. Stunning! Who wouldn’t want to sleep over and feel that plush rug underfoot?! Last but by no means least, I must mention Aura By Tracey Ellis – every season this linen designing powerhouse puts out seriously great gear for kids. Quilts mix and match with each other making them a perfect choice for kids sharing a room and wanting individual linen, but still working in harmony with each other (just like siblings, ha!). If your decorating budget extends only to new linen and a few knick knacks, my best tip is to invest in great linen and head to Kmart and Ikea for funky, affordable accessories – or involve the kids in making your own!